At this point, the smart card is ready to be used if you will be using the PIVKey Minidriver for deployment (Option 1 from the article PIVKey Deployment Overview). 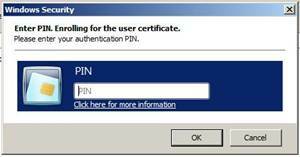 Option 1 requires the PIVKey Minidriver User software be installed on all machines where the card will be used. If you will be using the standard Windows PIV minidriver, or any other middleware that supports PIV cards, for deployment (Option 2 from article PIVKey Deployment Overview), then you must map the PIV certificates (or they could have been set up to map using an OID in the certificate templates Extensions property tab, see Mapping a PIV Certificate using an OID).